Before we get into the Audio Technica AT2035 large diaphragm cardioid condenser review..
Max SPL: 148 dB. What is SPL? This is a great all around condenser mic and proves to be very versatile at an affordable price point. It’s a work horse and will be your go to for many different studio applications. It comes in at a nice value, boasts really impressive sound, and has a solid and heavy build. Not many microphones come packaged with more than a case these days, so the fact that this one has an XLR cable, shock mount & pop filter at a great price makes it incredibly valuable to me. The quality of the shock-mount and cable is excellent. However, the pop filter has gotten numerous complaints, so you would be better off purchasing one separate if it does indeed give you problems. A person below in the comments asked me to recommend one, So I will: I have used the Samson PS01 in conjunction with my Samson C01 for about 8 years. A great buy! The snake arm is extremely flexible and the filter feels nice and heavy. A real durable piece of equipment!! This is really where this mic shines. It is very neutral sounding, and will not color your recording in any way, but remains crystal clear and full bodied. It is also very sensitive, which can be a good and bad thing. It will become a bad thing if you aren’t recording properly in the right environment. This mic is fairly transparent, with a touch of warmth and will catch subtle nuances in your voice. Some are calling it the best Large diaphragm condenser microphone in this price range, and claim that it can compete with other mics in higher price ranges. Large Diaphragm vs. Small Diaphragm. This mic also records guitar, drums, and piano, and even saxophone. The piano in particular is very demanding. It’s frequency range covers the entire audible spectrum, and it has a very wide dynamic range. The AT 2035’s ability to provide a balanced sound across the spectrum with ease makes it invaluable. Other reviewers have been impressed with it’s ability to handle/record pretty much anything you throw at it, and also do it well. The build quality is superb and reviewers mention that it is indeed a heavy microphone, so a good mic stand is certainly in order for this beast. XLR cable (one is provided in the package!) What is XLR? 48v phantom power via audio interface or mixer. What does an audio interface do? A rudimentary understanding of how Acoustic Sound Treatment works. Given that this mic is a condenser, it will pick up everything. A sequencing program such as the free Audacity, or the very user friendly Reaper. This is a very valuable and versatile mic at a great price, and includes 3 extra accessories that most other mics do not provide. I have reviewed a bunch of different microphones in other articles, and none of them provide an XLR cable. A lot of times that is such an inconvenience to me because then I have to go hunting for one and as you know, there are a million to choose from. The shock mount that comes with this set has been generally favored. The Pop filter however has been the weak link here. You will want to invest in a better one. The biggest selling point is that it can handle a wide variety of different applications, from rap vocals, to singing, to pod casting, to live streaming, as well as a ton of different instruments. And it does all of this near flawlessly, as most reviewers have pointed out. It is very warm, but neutral, and handles highs without peaking at all. One reviewer said that he turned his gain down to 50% and could still record very loud with great results. Well that’s about it for now folks! Hope you enjoyed my review of the Audio Technica AT2035 large diaphragm cardioid condenser! Do you guys think this mic is a good value? Let me know!! If you have any other specific questions, please leave them down below as well.. I very much look forward to speaking with you! MXL 990 USB powered condenser microphone | EASY! Wow, you have a great start to your website here! Cant wait to see your next posting! Thanks Stephanie! Keep checking in! I appreciate you visiting..
What a great review, I like how the section where you listed who this mic benefit. Also the DIY vocal booth. Thanks Phoebe! I appreciate you stopping by.. come back anytime! What a nice review… I personally like the fact that you laid out who the audio technica at2035 will be for. Fitting such a broad range of functions is very helpful. I been looking one specifically for podcast I might give this one a go. In the future maybe you should do a best 5 for podcast that be intriguing. Thanks so much for stopping by and for the suggestion! I will do that article very soon. Come back anytime.. Thanks very much for the review. You have really described the pros and cons well. I think it’s great that the microphone comes with an XLR cable. Would you say that this is the best value microphone that you have reviewed? Or is there something for a better price you recommend? If it’s not, it’s really high up there.. top 3 definitely.. I say that because I have reviewed the AT2020, and while a great entry level mic, I’ve read that the 2035 is light years better than that.. and the AT2020 gets really good reviews across the board!! 4) I do also have the Samson C01, and it’s been going strong for me for 8 years! Good things come in small affordable packages I suppose.. It’s only like $70 dollars or something.. and crystal clear. Not the sexiest mic out there, but it certainly gets the job done!! I know that’s a bit to take in.. but those are all solid..
thanks for stopping by!! If you have any other questions please ask!! I’m in the market for a microphone, I do have an AKG condenser but I loaned it out and have received it back! This looks ideal for my intended purpose of doing youtube guitar lessons, will it work ok as an overhead? It’s been so long since I had my DAW, all the software and hardware has moved on a generation, so I’m having to relearn a lot, so I can see myself spending a fair amount here on your site. Sorry Jay the video I tried to link you wouldn’t show up.. I pasted it in the article above if you wanna check out the review from youtube! Holy smokes that looks like a nice microphone! It must be for larger diaphram singers? IDK LOL. I know I have a pretty nice mic I got the blue bluebird it was like 300 bucks, and well worth the investment, but it’s the only instrument I really need when recording, aside from the preamp. By the way, is that you in the video? He had a nice voice! As far as Large Diaphragm mics, they are the most versatile and can record basically anything you want, which is why this one becomes so valuable! But Nah that’s not me lol. But that’s cool about the Blue bird. I was looking into those as well! There are so many mics out there it can be hard to choose if you don’t really narrow down exactly what you’re looking for. Thanks for stopping by man, come back anytime! I’m actually looking for a mic particularly to record guitar and piano. Would you recommend this one for that purpose or are there any better choices for instrument recording? This one is actually specifically mentioned as one of the best to record guitar and piano!! Check out the article again.. The section called Recording Instruments. I would highly recommend it. I had done a lot of research and many people were bragging about it’s ability in this area.. Thanks Ice! I’ve been furiously typing lately! Hope you come back soon! Very interesting web page.I’m familiar with audio Technica and think they offer a lot of bang for the buck.The subject matter relates to the purpose of the website. Good content that is very informative and useful.The website is very well done and holds my interest,which is not easy to do.All in all,a very good presentation on a very affordable product with some criticism on the mic filter. I’m not sure about the video, i overlooked it at first and went back to check it out but was distracted by things in my home. That is a great idea actually! I think I will do that for this article.. I really appreciate your feedback and for stopping by.. Come back anytime! Wow, this is such a cool looking microphone, my daughter sings, she has a beautiful voice I think this would be perfect for her, although I might borrow it now and again for a bit of kareoke at home. LOL!! I have always wanted to get a good microphone but something I have never actually searched for, I am really happy I have found this post, I love the video btw, I might have to try that one too!!! Just read your other review about the AKG perception 420 mic and so now I’ve been browsing around at your other reviews. This mic also got great ratings, I’m wondering, what is the difference between them? Is it the style of singing you may be doing? Both look like great mics at a reasonable cost. The price difference is only about $20, so I’d say that it’s due to the 3 different polar patterns you can record with on the AKG .. It is nice to have a few different options !! It’s tough because looking back, I really had to scour the internet to find people talking about the 420. Everything I read was positive! This mic (The AT2035) was a bit easier to review because it is very popular, and people rave about it. Check out the video review, you may decide on this one.. These mics are very similar, so to me it’s kind of a toss up..
1) The AT2035’s biggest selling point is versatility and value.. it can handle a lot of different studio applications/instruments etc. and comes with a great shock-mount, XLR cable, and pop filter (although the pop filter is rubbish by most accounts). There’s a link in my article to the Samson PS01 pop filter, which I’ve had for 8 years! 2) The AKG is also extremely versatile because of the 3 patterns you can record with. It also handles vocals and instruments very well..
3) Both mics are very neutral, and you get an honest reproduction of the sound you record with them. I’m not a mic connoisseur, but i learned many things thank to your post. Many friends of mine are music artists and I will definitely recommend them your website. The audio technica at2035 looks like a good investment. I had no clue of the price of a mic, but it doesn’t sound expensive compared to the real value it produces! Are you a singer? I used to play drums, and it was always a struggle trying to record what I was playing. I would have loved to see your post back then! Keep working hard on your website, it looks really nice. I would greatly appreciate it if you did that! The AT2035 is a mic that I am definitely considering as my next one. No I’m not a singer but I do occasionally like to rap! Thank you so much for stopping by! Hope to hear from you again..
Hey there, was doing some research for my nephew as he wants to start a recording studio. The audio technica at2035 large diaphragm cardioid condenser looks amazing. I looked at other microphones and none can really compare to this. For the price and the quality you can’t beat it. Great review, and also has a great review on Amazon. Will let him know and he will have to check it out. Might have to snag one up as a good starter mic! Good to hear from you again! I would really appreciate it if you directed him to my site! It is growing fast and I’m going to be writing a lot of articles for the knowledge base section, as well as more blogs and reviews of course! Thanks so much for stopping by! The AT2035 really does make my mouth water. I may pick one up soon as my next mic! Great article and well written. I will forward this on to a friend of mine who does live streaming. I think this would work perfectly for him. He’s always complaining about what he is currently using. Thanks for sharing. My son may be interested in this as well. Thank you Tanya, that would be much appreciated! The AT2035 is such a great option as an all around versatile and quality mic..
I’ve liked your review post/article and how you’ve presented to us quality information about the audio technica AT2035. As a blogger it’s very important for me to have a super quality MIC for podcast and I’ve liked this one. Thanks for that very practical post and all best in your goals/objectives. Thanks for stopping by.. Do you already own the AT2035? If so let me know how you like it. I’ve heard so many good things about it. I really like this article, my friend recently built a home studio that he records in and also has recently had people come and pay him by the hour to record. I like the way you displayed your content and the media you added and I also really like yours ideas on how to set one up in case I ever decide to. I appreciate that bud! That’s pretty cool though. I have thought about doing it. I may in the future if I can get a really nice mic, and a good studio space. Do you know which mic he has? It would be interesting to find out. Keep the site bookmarked for sure! I am always adding to and updating stuff. Great review here. Enough information is covered to allow consumers to make a better decision. Highlighting the versatility of the microphone is a real selling point too, It adds value to your review as people will be able to see the benefits of buying the product. Do you have suggestions on a mic pre-amp that will complement the characteristics of this mic? As far as mic preamp, it’s a tough call. 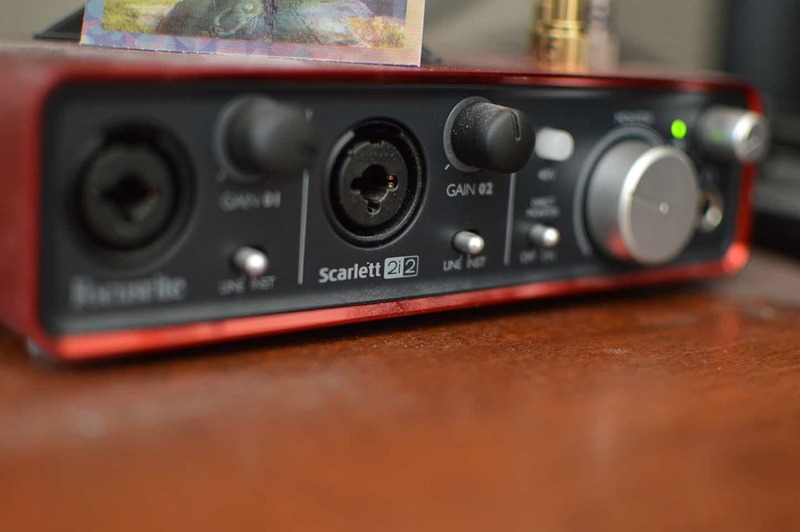 I do recommend the Focusrite Scarlett 2i2 in the review, which isn’t a mic preamp per se, but does have built in preamps which work extremely well for a variety of entry, to mid level condensers such as the AT2035. The problem for many budget enthusiasts (myself included) is that we simply can’t afford a stand a lone unit, which can get pretty pricey ($1000 range) .. If that’s the case for anyone reading this, just go with an interface for now. They do the job just fine! If I had to recommend a preamp, the FMR RNP 8380, and the RME Baby face are both great options. Whatever you do, don’t get an M-Audio interface .. they are complete rubbish in my experience, and many others. I’m not a recording artist or anything like that. But my wife and I both LOVE to sing. Would this be really good, or overkill? Would I need anything else if it’s used for karaoke singing purpose only? Thank you. Great review, BTW. The AT2035 is a great all around mic at a nice price, but you will need a separate audio interface to power it since it requires 48v phantom power. Fortunately, you can use this setup as a reliable solution because of the fact that you can switch out mics and the interface comes in handy for a lot of things: Hooking up studio monitors, microphones, headphones, etc. My recommendation would be the Scarlett 2i2 with the AT2035! As for actual karaoke mics? Check out the best mic for karaoke. Hope that helps! Let me know if you have any other questions. I thank you for the kind words!